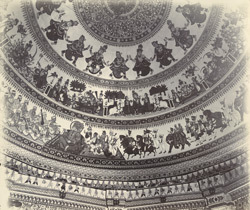 Photograph of the interior of the dome of the Swami Narayan Temple at Junagadh, Gujarat, taken by the travelling commercial photographer F. Nelson in the 1890s. The album is inscribed: “With best compliments from H.H. Rasulkhanji, Nawab of Junagadh (India)” and was formerly in the collection of Sir William Lee-Warner (1846-1912), who served in the Indian Civil Service and was a Member of the Council of India between 1902 and 1912. The temple was built by the followers of Swami Narayan, an early 19th-century religious reformer later worshipped as an incarnation of the Hindu deity Vishnu. Originally named Sahajanand, he was born near Gonda, Uttar Pradesh, and migrated to Gadhada in Gujarat, where he became a learned Sanskrit scholar and ascetic. This view shows part of the ceiling in the temple interior decorated with frescoes depicting scenes from Indian mythology.